Osama bin Laden and the Death of the Wicked "The wicked plot against the righteous and gnash their teeth at them; but the Lord laughs at the wicked, for he knows their day is coming. Apple may have secured the capture of OBL! succeeds in crushing the Taliban, Al Qaeda, and Osama bin Laden. I would like to see Osama bin Laden stand trial, I would like to see us have the opportunity to bring out in open trial the evidence against him. The United States Government earlier today informed that Osama bin Laden had been killed by security forces somewhere 'deep inside Pakistan'. THE DEATH OF OSAMA BIN LADEN "As the world celebrates the death of Osama bin Laden, I wonder if this reaction is worth a life so trivial. Drawing on intelligence reports from European counter-narcotics and intelligence agencies, interviews with experts and law enforcement officials both here and abroad, and European press accounts, this magazine warned in explicit detail about the likely consequences of allying ourselves with the KLA--not the least of which would be emboldening the group's chief ally and financier, Osama bin Laden. Osama bin Laden is, of course, hardly a suitable heir to the Third World liberation movements of the mid-twentieth century, but he does purport to speak for the downtrodden and against Western capitalism and militarism. is essentially a concise encapsulation of what we've learned about Osama bin Laden in the days since the terrorist attacks in New York and Washington, D.
This implies that the British and Americans are the theocrats, and Afghanistan and Osama bin Laden the democrats, which is, of course, nonsense. 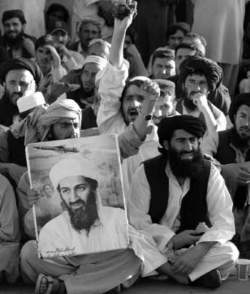 Life for the people of Afghanistan took another turn for the worse last month, when the United States began military strikes in pursuit of Osama bin Laden, whom U. A man detained in Turkey yesterday who was initially thought to be a brother of Osama bin Laden was not in fact a brother of the Saudi-born militant, Turkish officials said last night. He also said he had received "powerful, incontrovertible evidence" from intelligence agencies linking the Saudi-born millionaire Osama bin Laden to the attacks America.